Carefully curating each and every piece that goes into a nursery is part and parcel of the nine month countdown. But something to keep in mind, is that your little one will be a baby for such a short amount of time. If you’re clever with your purchasing and styling, you can create a nursery that will grow with your child – and in the long run, save you money. 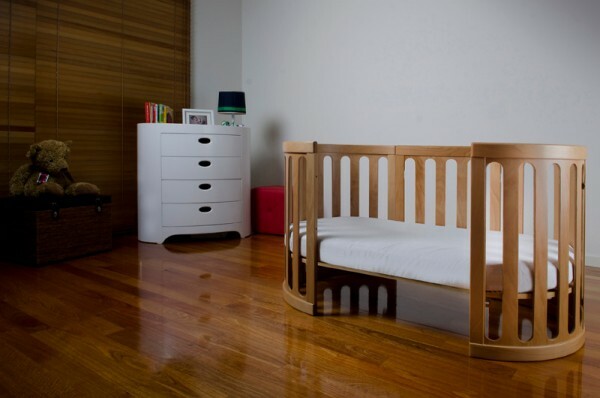 Part of the excitement leading up to your baby’s birth is in creating a beautiful space to become your new baby’s nest. For the first few months, that space will be (hopefully) all about sleeping and feeding. But you’ll be surprised by just how quickly the nursery needs to adapt with your growing child – incorporating play, exploration and learning. Here’s how to give your baby’s nursery room to grow. The largest investment you’ll make when it comes to the nursery is the furniture, so you need to get bang for your buck. The best way to get your money’s worth from your cot and change table is to look at convertible options. Cots that convert into toddler beds are a solid investment, as are change tables that can be used as storage. The Cocoon Nest Cot is a brilliantly adaptable piece of furniture, that will take your child from newborn, to toddler and beyond. 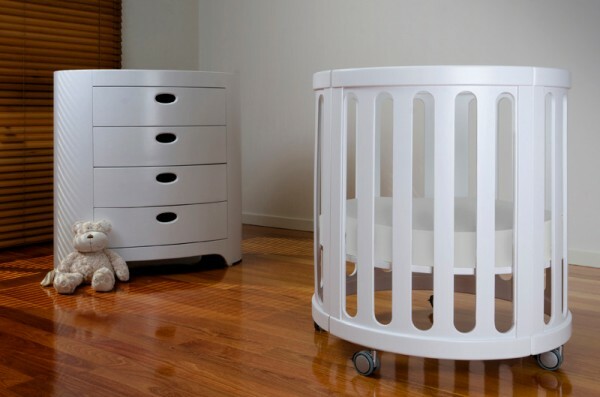 The Australian designed Nest starts off life as a beautifully contemporary bassinet (with wheels, so it’s easily moved), and then evolves into a cot. The Nest’s Australian design means it will fit easily through standard doorways, and its natural colour works well in any nursery. Once it’s time to move past the cot stage, the Nest transforms into a toddler bed, and finally becomes a stunning table and chair set (pictured below). The transition from bassinet to cot to toddler bed will be a little easier since your child will be in a familiar environment the whole time. With a convertible piece like this, you get four pieces of furniture for just one initial outlay. What’s more, it’s made from European beech – a wood known for its strength and longevity. Likewise the Cocoon Nest Change Area (pictured in white above) will make its impact felt over many years in your child’s room. Initially a change table, later on it transforms into a fabulous storage solution for smalls and toys. Most parents-to-be will give their baby’s new nursery a lick of fresh paint, but it’s best to keep the colour warm and neutral. While painting the room bright yellow, pink or blue may seem sweet, it does mean that as your child outgrows the nursery, there could be a big painting job ahead! Best to keep large areas as subtle as possible, and instead use toys and decor to add a personal touch. Removable decals are also a great, non-permanent way to inject some personality into a baby’s room. Choosing the right chair for your baby’s nursery is really important. Make sure it’s as comfortable as possible, and invest in a solid piece of furniture. This will be the place you nurse, feed, rock, comfort and read to your child for many, many years. Choose a neutral fabric, which can be personalised using a chunky throw in a bright colour. Another great way to personalise your baby’s nursery is through artwork. There’s no need to stick to just children’s art – choose any pieces you love, or that make you happy! These can be changed often, and no doubt as your child gets older, their own artwork will be adorning the walls. It’s a way to keep the nursery adaptable as your child grows, and their tastes change. Creating a dedicated reading corner in your baby’s nursery might seem a strange thing to do in the early days. Your newborn won’t be interested in books for some time, so initially this space will be decorative – you can display favourite books from your childhood. Once your child is old enough to take an interest in books, having them handy in the one spot will be a godsend! Eventually, it can become a little work area – with the addition of a small table and chairs. With just a bit of forethought and preparation, your baby’s nursery can become a haven that grows with them for many years to come.